Synopsis: This seminar highlights activities and discussions on the challenging topic of power dynamics in the U.S. Students will learn tools, frameworks, and common language to delve into anti-oppression work. It is reflective, experiential, and participatory. Race, class, ability, gender, religion, ethnicity, age, sexual orientation…bring it on! Synopsis: Explore the diversity of the Indian subcontinent in a “choose your own adventure” themed lesson, where the class will direct the discussion to engage in various topics most of their interest while pulling together threads along common themes. Topics may include Partition, Gandhi, the Ramayana, Indian languages, Bangladeshi history, Indian holistic medicine, current Indian politics, and more, according to the curiosities of the class. Synopsis: Dubbed a “basket case” by Henry Kissinger at the birth of Bangladesh as a new nation in 1971, this country has often been portrayed as a place of famine and natural disaster. Bangladesh has recently garnered more international attention as the new home to hundreds of thousands of Rohingya refugees from Myanmar, but the news often eclipses a more nuanced understanding of the rich Bangladeshi and Bengali culture. This interactive lesson will provide a basic introduction to Bangladesh’s history, including the effects of Partition on present-day Bangladesh and the country’s war for its independence, and touch on the literary and musical influences that define the culture of a nation. Synopsis: Drawing on more than 11 years of life and work experience in China, doctoral research in Anthropology, and a passion for Chongqing’s local history and economic transformation, Jody will introduce students to this city of 12 million and discuss migration and urbanization in China today. Speaker: Jody Segar, Jody’s lifelong interest in China began when he first took a Chinese language class in high school…he went on to spend many years studying, working, conducting ethnographic research and living throughout China. Jody is passionate about introducing students to China’s diversity – especially it’s religious traditions, food, music and modern history. Bonus Topic: For interested Chinese language classrooms, Jody also enjoys performing and discussing Chinese pop songs! Synopsis: There are 1 billion+ Muslims spread across the globe from all different backgrounds. The socio-political events of the last decade and a half have made it more important than ever for Americans to have a basic understanding of and a forum to ask critical questions about Islam. Shino provides a quick overview of the 5-pillars of Islam and discusses the different ways in which the religion is practiced across the Middle East and North Africa. Shino draws on her own observations and interactions based on her years volunteering, working, or conducting research in Morocco, Egypt, Jordan, and Oman. Synopsis: Where is Taiwan, and what makes this island similar to and different from other parts of the Chinese-speaking world? This interactive lesson will provide a basic introduction to Taiwan’s history, including aboriginal history, the Japanese colonial period, the martial law era under the Nationalist Party, and democratization in the late 20th century. Students will leave this lesson with the historical context necessary for understanding both the complexity of Taiwanese identity and the island’s pivotal role in China-US relations. Synopsis: The artist and visual designer Yang Liu was born in China and has lived in Germany since she was 14. By growing up in two very different places with very different traditions, she was able to experience the differences between the two cultures first-hand. Drawing from her own experience Yang Liu created minimalistic visualizations using simple symbols and shapes to convey just how different the two cultures are. In this lesson, students will analyze images that represent different aspects of Chinese and western culture and discuss how these differences might play out in the real world. This lesson can be facilitated in both Chinese and English. Synopsis: Historically, land has been set aside globally in national parks, reserves, and conservation areas in order to protect it from the impacts of human development, despite the less obvious interconnectedness of all land and water. But what does this say about our valuation of other lands like cities and landfills? We explore how this standard and others have transformed our perception of what “nature” is and how a focus on sustainable development and environmental justice provides a different option both globally and locally. Speaker: Kelsey Rae Dailey, M.S. Hydrology and Environmental Studies, University of Colorado Boulder; B.S. Geological Sciences, The Ohio State University. Kelsey is as an Earth scientist and educator who has worked with students in Southeast Asia, China, Central America, and across the USA. She is passionate about the roles of science communication and self-awareness in the human-environment relationship. Synopsis: Climate change and globalization are causing extreme ecological and cultural transformations to happen everywhere on our planet. From remote inland villages to lush tropical beaches, no place is untouched. Learn about the basics of climate change, the impacts to come, and how thinking globally while acting locally and approaching the future and others with compassion can heal our “doomsday” relationship with this wicked problem. Synopsis: Although everyone in an American classroom would recognize a fortune cookie, what if we told you the same is not true in the Chinese world? Evidence shows that fortune cookies actually originated in Japan. Why then has the fortune cookie come to represent China and influenced evolving conceptions of “Chinese-ness” in the United States? Join Marcus for a fun discussion on the impact of language and translation on cross cultural image creation. Synopsis: While their most recognized trading routes lie near Cusco and Machu Picchu, the Incan empire’s network of trails spanned the length of South America. However, great civilizations and animals thrived across the continent before the Inca and created the foundation for these routes. Ben focuses on the role early llama migrations played in helping the Inca create footpaths in Bolivia that connected regions ranging from 17,000 to 500 feet, as he opens a broader discussion about how trails, roads, and highways are created through ancient processes. Speaker: Ben Daley, Psychology and Latin American Studies, Lewis and Clark College. Ben is a current field instructor in South America. Synopsis: Feminism is often thought of as the advocacy for equality among genders. But can the goals of feminism change within impoverished communities that suffer from inhumane working conditions? In Bolivian mining towns and cities, groups of women organize to alleviate hunger and provide alternative work opportunities for all, through empowering women and changing gender structures. Ben discusses Bolivia’s history of exploitation and inequality while asking the broader question: how can a society resist oppression if half of its population is oppressed from within? Synopsis: Every month thousands of people from Guatemala, Honduras, and El Salvador embark on a perilous journey to reach the United States. Rich will draw on five years of work with independent media and social movements in the region, including original interviews with participants in the October Honduras caravan, to explore why people come to the US, the dangers they face along the way, and the social, economic, and historical factors that have led to recent waves of migration. Speaker: Richard Brown Since 2013, Rich has worked in Guatemala with independent media and social movements as a journalist, editor, and translator. He also leads Dragons summer programs to introduce students to inspiring Guatemalan communities. Synopsis: Rich draws on five years of work with independent media and social movements in Guatemala – a majority-Native American country – to bring Central American voices into the classroom with original videos and interviews. Central America is the most dangerous region of the world for environmental activists, but indigenous movements are having a greater impact than ever in their struggle to overcome centuries of marginalization and oppression. The presentation explores the goals and perspectives of Native American social movements in Central America, the deadly threats they face, and the role of the United States. Synopsis: Every month, thousands of Hondurans begin a perilous journey to the US. But what’s driving their exodus? Using original interviews with participants in the October caravan, Rich draws on five years of work with independent media and social movements in the region to explore how the caravan was organized, why people are fleeing Honduras, the country’s wild, fascinating relationship with the US. Synopsis: From the Amazon to the Colorado River Basin, explore the relationship we have with water and how it has shaped our social and political climates. David will relate the environmental impacts dams have had on local ecosystems with the economic benefits that are essential to global economies. David will share his experiences interacting with local communities whose lifestyles are dependent on these meandering giants. This lesson is also available in Spanish. Synopsis: Stress, anxiety, and struggle can leave us feeling overwhelmed and under empowered. How can we source happiness amidst the challenges and pressures of daily life? Pulling from the latest research in positive psychology, Aaron offers practical and proven tools to understand and foster a more positive mindset. A popular talk with students and teachers, attendees will walk away with an awareness of our power and choice to create happiness in myriad small yet important ways. Speaker: Aaron Slosberg, M.A. History, University of California. B.A. Religion and History, University of California. 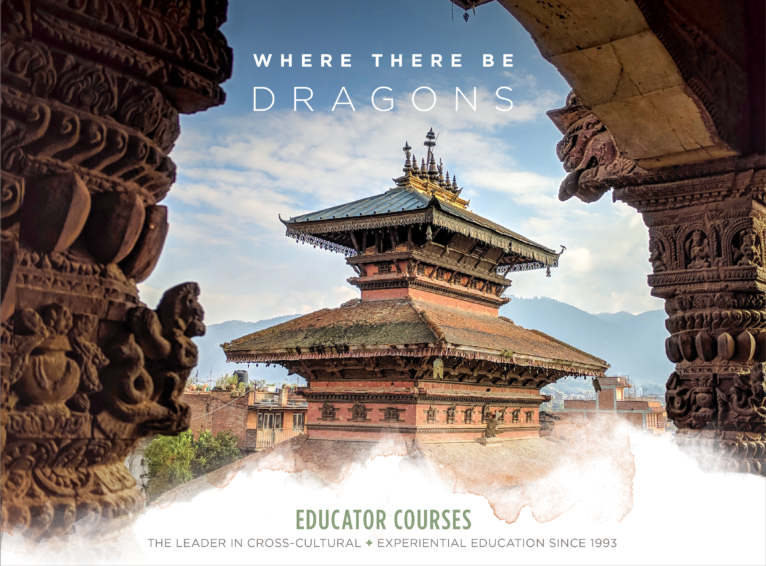 Aaron has spent 600+ days in the field as a Dragons Instructor in Guatemala, Bolivia, Peru, and Indonesia. Synopsis: What happened to the Inca? This is common question for anyone interested in the history behind Machu Picchu. The people of la Nacion Q’eros would simply reply, “we’re still here.” Nacion Q’eros offers a colorful glimpse into traditions surviving in the direct lineage of the Inca. And yet, it also represents a complex world struggling with the sacrifices and adaptations mandated by globalization and development. Accompanied by incredible images, Aaron shares stories from his time visiting the communities of Q’eros. Synopsis: For millennia the Bajau people have roamed the tropical waters of southeast Asia. With stricter immigration laws these historically nomadic peoples are being settled into floating fishing communities around the archipelagos of the Pacific and Indian Oceans. Aaron shares incredible stories and images from his 6 years of visits to one Indonesian Bajau village completely detached from land. Learn about the colorful mixture of Islam with local beliefs, traditional spear fisherman who can dive to over 80 feet without oxygen, the impacts of global warming on coral reefs and communities, and the fascinating realities of a people far removed yet still connected to our daily lives in the US. Synopsis: The importance of diversity is difficult to argue against: conformity is the enemy of innovation and difference is potentially a catalyst for discussion and growth. However, difference, as history has taught us, also presents challenges. This seminar explores some of the nuances behind division versus diversity through the lens of case studies where there have been intentional interventions to promote social cohesion. Specifically, we will look at the mechanisms behind the relatively peaceful transition out of Apartheid for South Africa and the complex role language has played in post-conflict Sri Lanka. These discussions will enable us to gain more insight into the complexities of achieving social cohesion and distill strategies, at an individual level, on how to seek and grow from diverse environments. Synopsis: Stories can change the course of history. We all have them and are often touched and influenced by the tales of others. From advocacy to entertainment, stories have the power to influence, amuse and evoke an emotional response within the listener. This workshop looks at the social and economic impact of selection of stories, explores ways to structure a story for engagement and impact, and gives participants the opportunity for practice. Drawing on the concepts of global citizenship and leadership, we will reflect on the impact individuals wish to have on the planet and the role story can play in advocating for this.